Kirk O. Hanson, executive director of the Markkula Center for Applied Ethics at Santa Clara University, is University Professor of Organizations and Society. In 2001, he took early retirement from Stanford University where he taught business ethics in the Graduate School of Business for 23 years. As executive director, Hanson coordinates the work of 15 staff who work directly for the Ethics Center and 50 faculty who are affiliated with it. The Markkula Ethics Center is one of the most active ethics centers in the United States, working in the fields of business, biotechnology and health care, K-12 character education, public policy and government, and emerging issues in ethics. Its affiliated faculty scholars work on all aspects of applied ethics, the professions, and their academic fields. 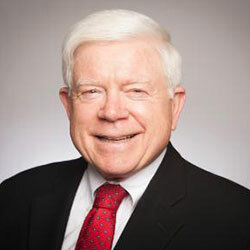 At Stanford from 1978 through 2001, Hanson was senior lecturer in business administration and a national leader in the study of business ethics and business responsibility. He was also faculty director of the Stanford Sloan Program, Stanford’s master’s program for mid-career executives. He taught in Stanford’s MBA and Executive Programs for 23 years. Hanson writes on managing the ethical and public behavior of corporations. His current research interests are social auditing and the design of corporate values programs. He was the founding president of The Business Enterprise Trust, a national organization created by leaders in business, labor, media and academia to promote exemplary behavior in business; the first chairman of the Santa Clara County Political Ethics Commission; and has written a weekly column for the San Jose Mercury News. He has served on the boards of the Social Venture Network and Students for Responsible Business, national organizations; and of American Leadership Forum Silicon Valley. He served on the Advisory Board of the Markkula Center for Applied Ethics from 1995 until his appointment to head the Center. He has twice chaired Stanford’s Committee on Investment Responsibility, which advises the Stanford Board of Trustees on social investment issues. Hanson is a graduate of Stanford University and the Stanford Graduate School of Business. He has held graduate fellowships and research appointments at the Yale Divinity School and the Harvard Business School. To read more about Kirk Hanson, visit his personal site.